The Shadow of What Was Lost (Shadow) is James Islington’s debut novel, and boy is it a big one. At just over 220k words, Shadow is in the neighborhood of Robert Jordan-sized fantasy. And it resembles Jordan’s work in more than just word count. An epic, sweeping fantasy featuring three intrepid youngsters finding their way in a world of magic and mystery, Islington’s Shadow is sure to hit all the right notes for fans of Jordan and Sanderson. While The Shadow of What Was Lost deals with a huge world and an expansive cast of characters, it focuses on three (you could say three and a half?) protagonists. Davian, Wirr, and Asha are all students at a school for the Gifted, people who can wield arcane magical energy called Essence. When a mysterious visitor arrives at the school, their worlds are turned upside down and they’re scattered to the winds. Left with bad memories, in Asha’s case no memories, the three friends have to make their own way in their new worlds while picking up the pieces of what they left behind. Meanwhile, another [unnamed] character wakes up in the middle of nowhere, with absolutely no memory of who he is. In their journeys, Davian, Wirr, and Asha discover hidden magic and dangerous secrets that could threaten their lives. The Shadow of What Was Lost fell flat for me. My primary complaint is that the characters felt interchangeable with vanilla personalities. Davian, Wirr, and Asha are all intelligent young people who generally use caution and approach everything with a level head. They all have the same priorities, namely protecting their friends and to an extent the rest of the world. They’re all well-studied, well-spoken, reasonable people. But that doesn’t mean that they’re interesting to read. I was left wanting to see what makes Asha ASHA, wanting to see some strife and conflict in Davian and Wirr. I love inner-motivations and I’d love to see that come to the forefront and clash with some of these characters’ priorities. That being said, I’m sure Islington has some plans for these characters in the coming books and this is just the first of the Licanius trilogy, so I’ll give him the benefit of the doubt on this one. Where Islington excels is in foreshadowing. The book is well-structured and the writing clear and concise. And — this is no minor feat — this book actually handles time travel in an interesting and un-ridiculous way! That certainly doesn’t happen often. 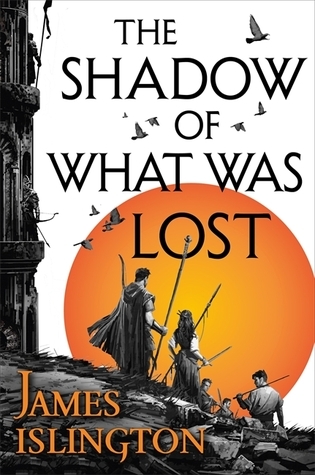 Read The Shadow of What Was Lost if your jam is sprawling epic fantasy with multiple magic systems and creepy enemies, if at the cost of character voice and progression. This has been on my TBR for a while and I just keep not getting to it. I was hoping for something really good. I’ll still read it but may hold off a bit longer. Yeah. I have had them on mine for awhile, too (this is David, btw). Griffin’s review makes me think I can wait a tad longer as well. I actually really enjoyed this series and am really looking forward to the final one next month. It is pretty derivative of past fantasy works and I would agree that intricate characterization is not Islington’s strongest suit. But I did really enjoy the intricacy of the plot as the story goes on. Reminds me, I still need to read book two! I did enjoy this one a lot…gave off all kinds of old school fantasy vibes.